For four years, I watched the horrors of war, conflict and suffering from the ISIS led genocide of the Yazidis in Iraq and Syria. In doing research for an exhibition on immigration in 2017, I discovered Yazda.org and its founder Haider Elias. It opened up a door for me to integrate my practice and personal convictions. I created a work of art about Haider and his family and brought him from Texas to California to speak to help untangle the complexities of the conflict in Iraq. In 2018, I received a Community Foundation Grant from Arts Council Napa Valley to travel to Houston and create monotypes with the Yazidi groups in Houston. I returned to Napa with the prints and am presenting a joint exhibition of the Yazidi monotypes with my etchings and prints that led to the project and a sneak peak of Phase Two. 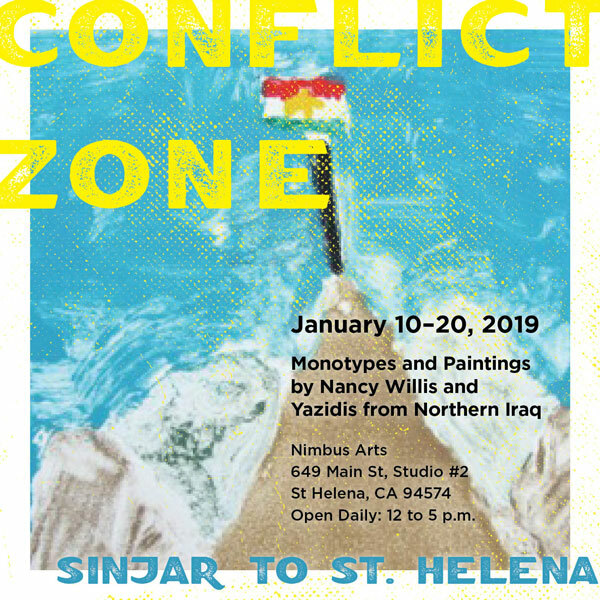 The exhibition Conflict Zone: SInjar to St. Helena will take place at Nimbus ARts January 10th to the 20th and coincide with a screening of the documentary “On Her Shoulders” at the Cameo Cinema on January 15, 2019. In February of 2019, the work will be exhibited at Brookhaven College in Dallas, Texas as part of the annual Southern Graphics Council printmaking conference.